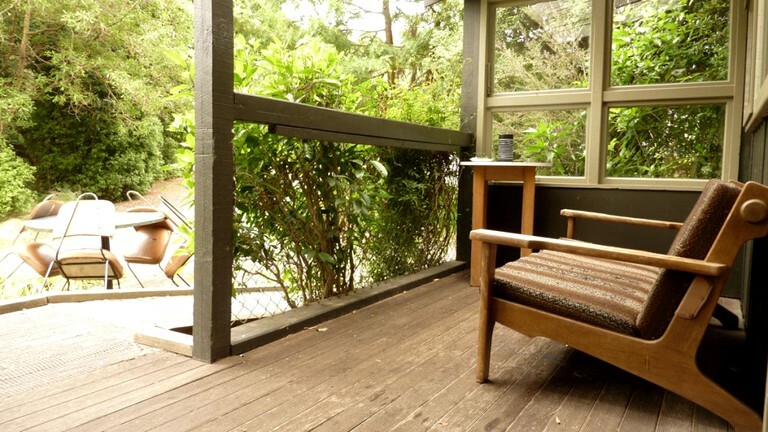 This retro cabin in riverside nature spot near Christchurch is located on New Zealand's South Island and can accommodate four guests. 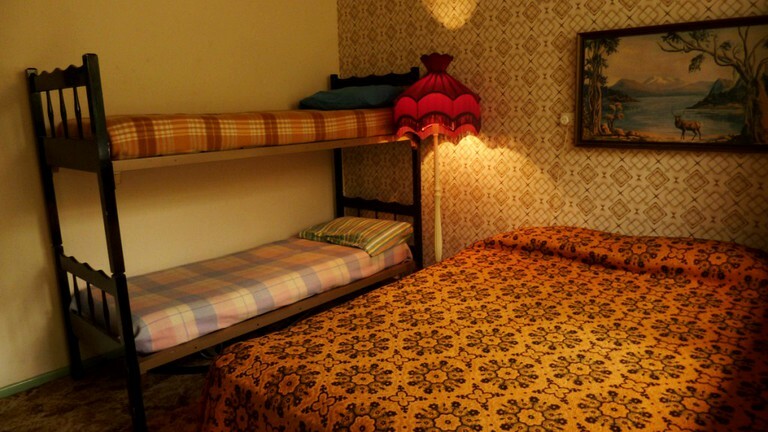 There is one bedroom and a shared bathroom in the separate ablution block. 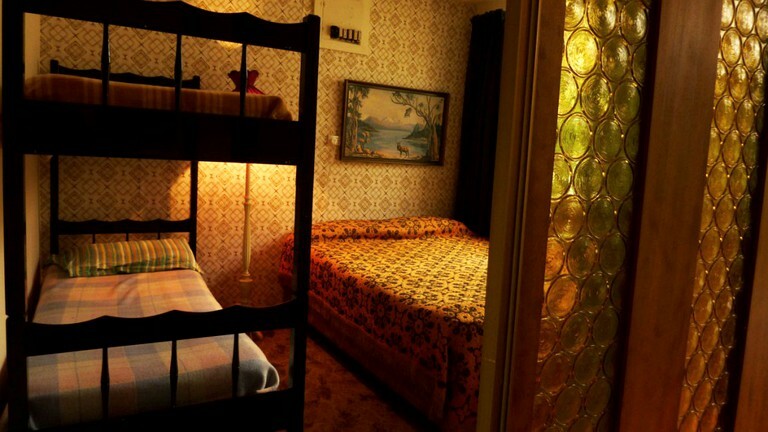 The bedroom has a queen-size bed and bunk beds. In the ablution block, guests will find a toilet, a sink, and a hot shower. Linens and towels are not provided but can be hired for an extra fee. In the living room, guests will find a dining table and a couch, plus quirky retro furnishing and decor. 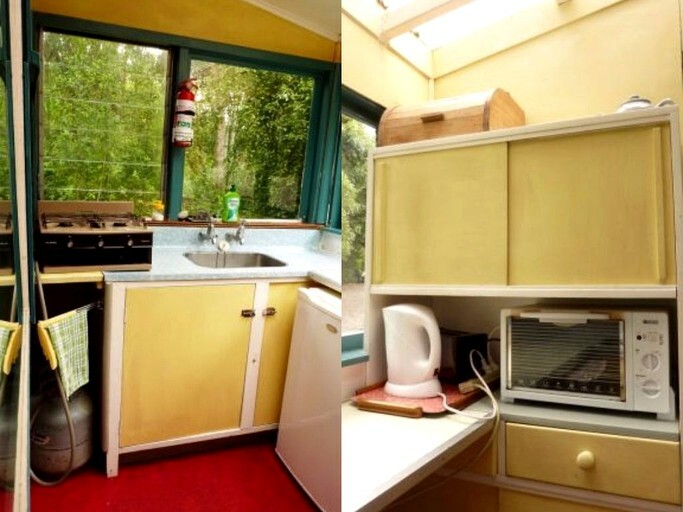 The kitchenette comes with a fridge, a benchtop oven, a cooking hob, a kettle, a toaster, utensils, pots and pans, and plates. Other amenities include a clothesline, a torch, and Wi-Fi. The campground offers a chance for guests to get back to nature in a traditional, relaxed setting. For maximum peace and tranquility, the site does not allow vehicles, so glampers can relax with the knowledge that the kids are safe roaming around the site to their heart's content. As well as the riverside location and picturesque views, the campground itself offers a number of 'back-to-basics' facilities including environmentally-friendly, dry composting toilets, two hot showers, a clothesline, free parking, and free Wi-Fi. For a small extra fee, glampers can make use of the covered kitchen area with fridge/freezer, toaster, gas hobs, microwave, and sinks. Children will be thrilled with the playground activities, complete with slippery slides, giant swings, and an in-ground trampoline! While the kids are busy, parents can fire up the on-site barbecue ready for a relaxing dinner on the riverside picnic areas. For guests wishing to make use of one of the Banks Peninsula's cycle trails, the campground offers a discount for cycle tourers. Laundry services are available for an extra fee. Please note that use of the covered kitchen area is also subject to a small fee. 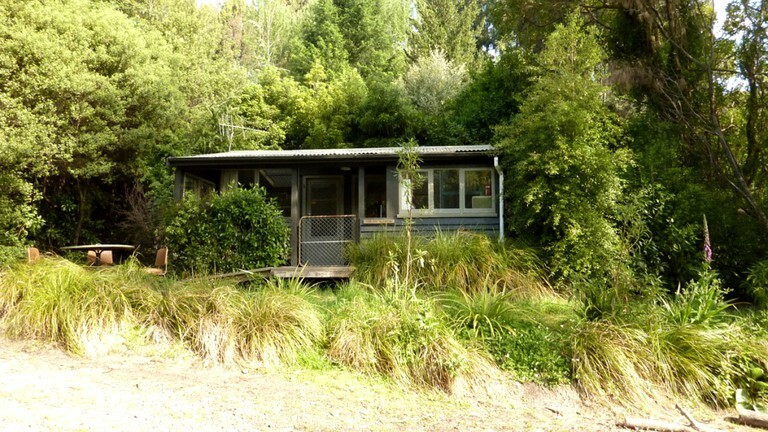 This campground is situated in the peaceful Okuti Valley on the famous Banks Peninsula with beautiful bays, stunning scenery, and quaint townships. The site is close to the harbor town of Akoroa, a French heritage township with historic buildings, an excellent selection of eateries, boutique shops, and galleries for an afternoon wander. 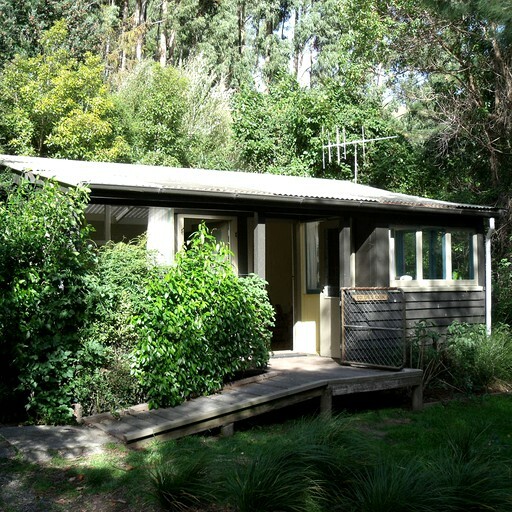 Glampers can enjoy a range of activities without even needing to leave the campground, with five hectares of native, unspoiled bush to explore, or the sparkling river with its many pools to swim and play on a hot summer's day. Beyond the site, guests will find the Banks Peninsula. A place of incredible natural beauty made up of a series of ancient volcanoes, Banks Peninsula is famous for its astounding views, glorious beaches, and pretty townships. There is an impressive network of walking tracks with unrivaled views, including the 35-kilometer Banks Peninsula Track, open for tramping from October to April. Alternatively, cycling and horse-trekking trails span the peninsula. Guests can also take to the seas by sailing or fishing for a day on the water. They could even venture out on a kayaking safari to explore deep sea caves and spot some local wildlife. The peninsula is home to fur seals, spotted shag seabirds, two types of penguin, and Hector's dolphins. To be sure to spot some local fauna, guests can visit the marine reserve at Pohaty / Flea Bay, which offers guided tours to see the largest little penguin colony on the mainland, with over 2000 penguins including the unique yellow-eyed species. Guests can relax on one of the peninsula's many sandy beaches - Okains Bay and Le Bons Bay are among the best places for swimming in the South Island. Surfing is also a popular activity with many impressive breaks just off the peninsula. Pets are not allowed. The property is child-friendly and has free parking. The campground is available for wedding hire, please inquire for pricing.